Accueil > The Bayeux Tapestry > Discover the Bayeux Tapestry > Tapestry or embroidery? 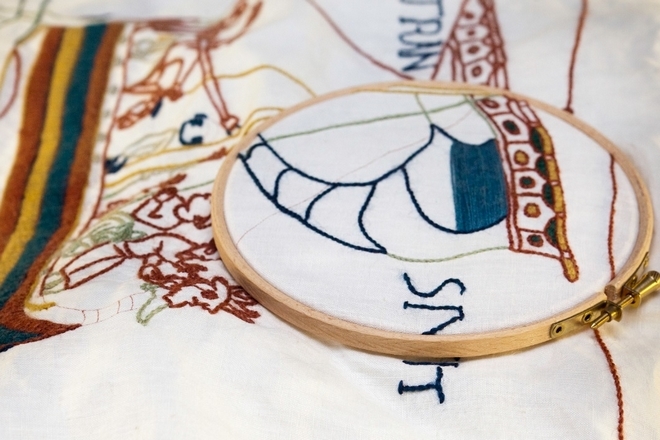 What makes the Bayeux Tapestry an embroidery? Despite its name, the Bayeux Tapestry is in fact a narrative embroidery, about 68.3 metres (approx 224 feet) long and about 70cm (approx 20 inches) wide, of which 50cm (approx 13 inches) are devoted to the embroidery itself. The embroidery consists of pictures and text inscriptions, and comprises nine panels of linen cloth joined together. The technique used is unquestionably embroidery. The regularity of the lines traced by the wool thread show that guiding marks, perhaps drawings, were made on the cloth. By contrast, the design on a tapestry emerges by weaving threads at right angles, so that image and cloth take form at the same time. Such narrative hangings, occasionally put on display for all the faithful to see, were not just intended to decorate churches. They told stories that the people of the time, the majority illiterate, could follow. As with the Bayeux Tapestry, they could become a piece of propaganda for a victorious conquest. Contrary to popular and romantic belief, the embroidery was probably not crafted by Queen Matilda and her ladies-in-waiting. No one knows for sure who created the Bayeux Tapestry. Most historians believe that Odo, Bishop of Bayeux and William the Conqueror’s half-brother, commissioned the embroidery to decorate the nave of the new cathedral of Notre-Dame of Bayeux, consecrated on 14 July 1077. 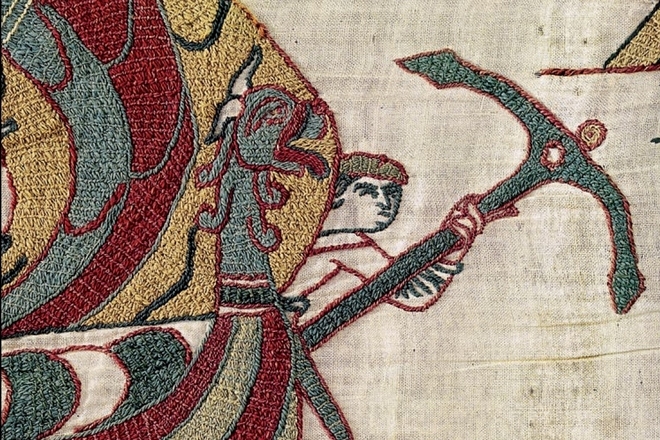 The scenes in the Bayeux Tapestry are embroidered in wool thread on linen cloth. The plants used to dye the wool were Dyer’s woad, madder and dyer’s rocket (or weld). Woad, a plant which is common in Europe, was used to produce indigotine, a pigment that gives the various shades of blue found in the Tapestry. As the pigment didn’t dye the fibres to the core, some of the blue motifs have faded. The roots of madder produce a red pigment used for the various red tones of the Tapestry – pinks, oranges and browns. As for dyer’s rocket, it used to be cultivated in Europe for its yellow pigment. The various colours used emphasise the amazing richness of texture achieved throughout the work by the use of four embroidery stitches: stem stitch, chain stitch, split stitch using two threads, and couching stitch, or “Bayeux stitch”, this last being used to fill in coloured surfaces. Both a historical and artistic masterpiece, the Bayeux Tapestry has been given many names over the centuries, including “Telle du Conquest” by the Cathedral canons, “William’s Little Cloth” in the 18th century, and “Queen Matilda’s Tapestry” in the 19th century. Although the original colours of the Tapestry have changed very little over the years (depending on the shades), those of the restorations made in the 19th century have faded badly, to the point of becoming white in certain scenes, especially the heavily restored final sections.